I’ve been trying to think of label that best describes some of my current writing ideas. I want to call it retro-scifi. 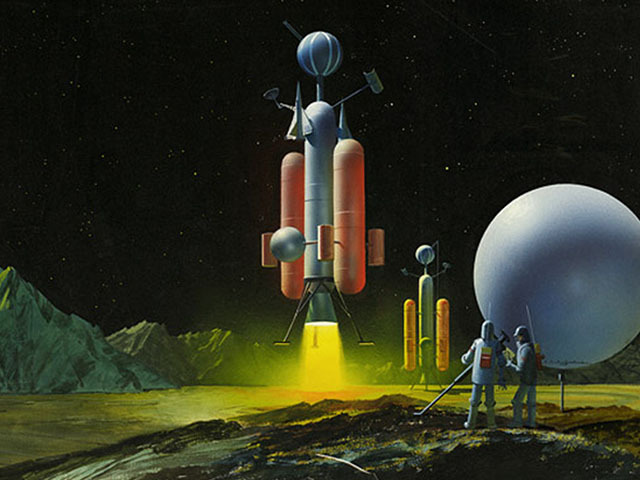 Sometimes that means artwork–sometimes fantastically done–to resemble the classic science fiction style of posters, illustrations, and comics in the 50s and 60s. That stuff is wonderful, but I’m not talking about graphic artistry. I’m wanting a phrase that describes stories. I thought about using the phrase vintage-scifi, but then that just sounds like I’m talking about older science fiction stories and movies. Again, those are cool, very cool, but it sounds more like garage sale items. It also occurred to me that maybe I could call it old-school-scifi but decided it was too many hyphens. I stumbled across a movie about two months ago called Space Station 76 that came close to what I’m trying to describe. I pressed the ‘info’ button to see what the movie was about and it said something like “A 1970’s vision of a future space station . . .” I sympathized with the writer’s problems describing it. Ultimately, Space Station 76 disappointed me because it was parody. I like parody, but what I am shooting for is more the style rather than parody. I don’t want to make fun of it, I want to honor it. Part of this comes from my insistence that science fiction is more than space stories. Don’t get me wrong, I love space stories. I’ve read three recently that I really liked (The Sparrow (click here for my review) and The Martian, and I also read Sonya Craig’s oustanding yet to be released space/alien tale called Outbound) but science fiction is more than space stories. Oh, and for this category zombies and dystopias don’t count either. So what makes a story retro-scifi? That might be in the beholder, but here are five qualities I’ve come up with. 1. The descriptions used for scientific items should be older words, older than fifty years or so. The word “computer” would work, for example, but “digital”, “mouse”, and even “network” I think would ruin the vibe. In a retro story the computer whirls, spins and shoots out information on a card of some sort. Think original Star Trek, not Star Trek reboot. 2. The word “atomic” is key. The word atomic is found all over the place in the older stories. Atomic war was always in the back of their mind. 3. Authority figures are also central, I think, to convincing the reader that this is an honest piece of fiction that could have been written fifty years ago. I think it comes from the authority-driven culture of the post-war United States, but when you read older science fiction there seems to always be a leader or a system, and then the key figure is almost always under that persons authority or in that system and has to work within it. Compare that with most modern literature where the underling always revolts against the system and changes everything. 4. There must be social commentary in the story somewhere. We who love science fiction have forgotten this noble aspect of the genre. So much of it strove to speak to injustices, folly, or societal ridiculousness. Many of Asimov’s short stories, for example, are explorations of the essence of humanity in the face of machine intelligence. The irony is there is no shortage of injustice, folly, or ridiculousness for us to write about. this particular blog brought back long-forgotten memories…..thank you….I was in my early twenties fifty years ago and an avid sci-fi reader back then. Keep up the good work.